An anti-stigma campaign I follow on Twitter sent me a message that “Actress Catherine Zeta Jones has been living with bipolar for several years and rejects any stigma attached to it.” Easy for her to say. It was further Tweeted that Catherine Zeta Jones says there is “no shame in seeking help.” For someone with fame and finances this might even be true. For Catherine Zeta Jones, mental health stigma and treatment are vastly different from the experiences of many who also suffer from mental illness. For her being open about her diagnosis and experiences is at least unintentional personal publicity. As they say: There is no such thing as bad press. In the case of celebrities a personal persona and public appetite is created and nourished by being a news story. It would appear that Catherine Zeta Jones has thrown herself in front of an oncoming car for the benefit of many but I would argue that the car has already driven by. The lack of blood and guts, spell evidence. Catherine Zeta Jones is portrayed as some patron saint of bipolar but what has she really risked? Stigma is at a point that it is rarely rolled out for the famous. I am not inferring that there is no such thing as stigma but little if any cuts through fame and favour. Call me cynical but these revelations don’t seem to affect these individuals beyond increasing their brand, public persona and popularity. If I’m depressed in bed or manic at the mall, am I apt to seek help or find relief in Catherine’s revelations? The rubberneckers look but the rest of us are too busy trying to survive. These celebrities don’t give interviews in their underwear next to dust bunnies; they follow a loose script in their personal libraries in Bermuda. Speaking of which, what meds do I take to find myself in Bermuda with a maid? I think “Catherine The Great” has been a source of conversation around mental illness but I would argue that her battle with stigma is similar to Don Quixote who mistakes windmills for giants and charges at full speed. My suspicion is that stigma is a word, for Catherine Zeta Jones. For many stigma is no windmill but a true giant. It affects self image, personal and family relationships, employment and status. When I think about bipolar I don’t envision a person like Catherine Zeta Jones who uses overpriced shoes for bookends because they’re too cute for closets. In my world people with bipolar have their shoes taken away so they can’t asphyxiate themselves with the laces. I imagine Catherine’s experience with mental illness has been challenging and difficult but in the scheme of things we are talking about First World problems in comparison to Third World problems. Did she have to wait six months to see a psychiatrist? Were the chairs in the waiting room plastic or leather? Did she have to wonder if she could afford her medication? Was she worried about missing work? Did she have to resort to disability assistance to feed herself? I’m waiting for one of these famous sacrificial lambs to tell us about their hemorrhoids. That experience is the same for us all and if I knew Catherine Zeta Jones used “Preparation H” I could actually hold my head higher at the pharmacy. There’s little fame in swelling so I shall suffer in silence. I’m trying to lose weight and have tried numerous diets as I am allergic to activity. Recently, I have been having some success by viewing various Conservative Party of Canada candidate, MP and ministerial communications. I can’t keep down most of what I eat as a result if and when I even have an appetite. Stupidity is for me at least mildly nauseating. Today I had a hankering for a double cheeseburger and a milkshake so I visited Minister for Public Safety Steve Blaney’s Twitter account. Fighting what seems like the flu I will forward a few words. If compassion had anything to do with conservatism minister Blaney would be all over the twitterverse with photo’s of himself towering over individuals with mental illness in a healthcare setting. Instead Minister Blaney allows individuals under his charge with serious and persistent mental illness to linger in solitary confinement. It seems with this government security and healthcare is like oil and water. As contrast we have the Conservative Party of Canada tweeting “We are the only party who will protect gun owners. Retweet if you’re with us.” I was ignorant of the fact that gun owners were a marginalized and vulnerable population. Minister Blaney’s twisted tweet includes an image of a semi-automatic rifle and his own quote: “Owners of the CZ-858 and Swiss Arms rifles that were ‘impacted’ can now use their private property once again, as should have always been the case.” I don’t know about my readers but I feel safer knowing this government is protecting gun owners. Guns don’t kill, governments do. If gun ownership is proximal to safety or security we are a nation of idiots. When the Royal Canadian Mounted Police (RCMP) issued the prohibition of these semi-automatic firearms, gun rights advocates were up in ‘arms.’ According to them 10 000 Canadians became criminals overnight because they now possessed prohibited firearms. Apparently they had difficulty looking up amnesty in the dictionary. Considering ammunition is the word preceding it I can see the problem. They may not even have come that close as they fixated on Americanize. Firearms lawyer Ed Burlew filed class action suits against the federal government and RCMP. Burlew’s lawsuit was seeking $10 million in punitive damages and $20 000 for each owner of the firearms in question for mental distress and anxiety. While ignoring the mental distress and anxiety of people with serious and persistent mental illness the conservatives capitulated. The only time this government is capable with mathematics is in measuring votes. Gun owners are organized and vote, people with serious and persistent mental illness don’t. Polls trump human decency and social justice every time. I was aware of the fact that this government doesn’t give a damn about mental illness but when their compassion is placed on pistol possessors the double cheeseburger becomes a distant thought. In fact I may be the only citizen in this country who has experienced serious and persistent mental illness in solitary confinement and was once a gun owner. Following one of my hospitalizations I was advised to surrender my shotguns. Possibly it was too traumatic and I have blocked it out but I have no recollection of mental distress or anxiety from the experience. Burlew’s lawsuit was both superfluous and humourous. This government takes on legal battles which they should submit to but capitulate for 10 000 votes. I wanted a sense of who these gun owners are. Google guided me to the Alberta Magazine Outdoorsmen, Alberta’s only hunting, fishing and trapping magazine. The forum I found was full of indignation. None of these outdoorsmen seemed to have names but are clearly nincompoops. ‘recce43’ said “do not turn anything in. laws only work if the public complies.” These words seem to fly in the oft repeated mantra that gun owners are law abiding citizens. ‘recce43’ did in fact know how to use capital letters as he explained at the bottom of the post “LIFE IS TOUGH…TOUGHER IF YOU’RE STUPID” He should know as he followed with “women have the right to work whenever they want, as long as they have the dinner ready when you get home” Minister Blaney and the prime minister must be proud to be able to accommodate and cooperate with such citizens. ‘Mistagin’ explains the reason the prohibition was repealed while solitary confinement remains a solution for mental illness. “I just sent off a letter to MP Blaney and PM Harper.” I can’t be the only one to get a chill thinking these individuals actually influence conservative policy. You are who votes for you. I understand that a minister responsible for public safety would be involved in firearm policy but how is it that Canadians are kept safe by allowing more semi-automatic firearms? Children who don’t own BB guns are proportionately less likely to have their eye penetrated by a pellet. It’s not science, it’s sensibility and common sense but that revolution has died. According to Canada’s National Firearms Association (NFA) prohibiting firearms has nothing to do with preventing bad behaviour. Possibly not but it minimizes the damage done in many of those instances. You can’t control the criminal but it’s tough to pull a trigger when the gun is with the government. The NFA is lobbying the government to eliminate prohibited categories of firearms, rescind clauses on barrel length and caliber that classify firearms and regulations affecting magazine capacity. They also want to eliminate ‘punitive’ safe storage and transport requirements, the Chief Firearms Officers and remove the administration of the Firearms Act from control of the RCMP. Basically the NFA would like to see shotguns next to six-packs at convenience stores. We need to ask ourselves if we want ‘recce43’ running around with rifles without rules. I complied with the recommendation to relinquish my rifles because as crazy as I was I was also insightful, responsible and conscientious. It is criminals who carry out offences using firearms but many of these illegal weapons were and are obtained legally initially. Minister Blaney and Prime Minister Harper need to pull themselves from the polls and decide if the freedoms of gun owners should trump true public safety. Just because you can lobby, write letters and make phone calls doesn’t make your influence or interests just. In this case it just makes for poor policy. I don’t believe I am the only Canadian who finds comfort in being different from America. Two important differences worth protecting are healthcare and gun control. This government is too busy aiming for votes to adjudicate ethically to either. I was looking over some jail letters I wrote years ago. My mother, an aunt and a family friend saved all the letters I wrote during my confinements. It’s interesting to read my observations and perspectives. I saw much more than bars when I was behind them. I learned lessons that the same time in school may never have yielded. I wrote the word “parity” and its definition on January 16, 2002. “A state of being equal and a theory in physics that any substance and its mirror image counterpart have the same physical properties.” I would like to argue against this theory as any mirror I stand in front of has less hair and more weight than I know I posses but I see its truth. A rock in front of a mirror is nothing more or less than itself. It has cracks and has no reason to deny them. It will not lose stature as a rock if it reflects flaws. I am not always pleased with my receding hairline but it is mine. I can still smile with it, I can carry a conversation; it really doesn’t take away from who or what I am. When I can recognize myself as I am; full of warts but fine thanks just the same I can be who I am. It is more reflection and less deception when I can see myself as light and dark. When we see our true substance and the mirror image as the same it in fact creates “parity” itself. “The state of being equal.” If I see myself as I truly am there is no maneuvering into being better or worse than others. We are all the same. There is little need to be anything in solitary confinement; the Hole. Whatever you are is all you live with. There is no need to say or do anything to alter your position as there is no one to posture for. I often crawled about my small space scratching notes on my papers and upon the walls and floor. My life had more importance than any time I was a free man. There was nothing to fear in nothingness. What would fester in your mind if it had nothing to occupy it? What if there was no phone, computer or company? Who and what do you connect with when you are the one and only for days, weeks or was it months? When it was just me most of my thoughts had spiritual significance. Realigious experiences and perspectives are often a symptom of mental illness. Maybe some are but wouldn’t that make God crazy? I remember when I was finally transferred from jail to the forensic hospital. As I exited the jail handcuffed and shackled I was at first struck by the open space. Being transferred is usually pleasant and a little like watching a movie. You see and hear things you are unaccustomed to. Green grass or the sound of tires on pavement. There were several jail nurses sitting at a table outside on break. I bowed my head and thanked them. They did what they could. I climbed into the kennel of the transfer van. It was basically like being a bean stuck to the inside of an empty tin can. I didn’t have much of a view and can recall no landmarks. I knew I was heading to St. Thomas but did not recognize the fact until we parked. After I left college and my lifelong dream of being a Conservation Officer, I applied to several police forces. At that time there were many more interested in police work than were ever hired. I did have one interview. It was with the St. Thomas Police Force. I have changed the header image on my blog. I wanted to find an image of solitary confinement. As prisoners we refer to it as the Hole or the Digger. I have written about it but reference to it does little to provide a realistic impression. I couldn’t find an exact replica of the confines I called home off and on for months but this one comes close. The Hole I resided in was smaller. The Hole I resided in had no raised bed; only a mattress on the floor. I was made to drag my mattress from my cell each morning and left with only a blanket. At night I was permitted to drag it back in. The Hole in the photo has a stool and raised desk area; these too I was without. The mirror on the wall was also missing. The stainless steel toilet sink combination is identical. When I was permitted to shave and shower I was taken to the medical range. The “window” you see in the photo was also absent which though minor may have given the impression I was not alone. For “security” reasons I lived under a 24 hour light. My Hole was cleaner when I wasn’t writing on its walls but it too had no wallpaper border. 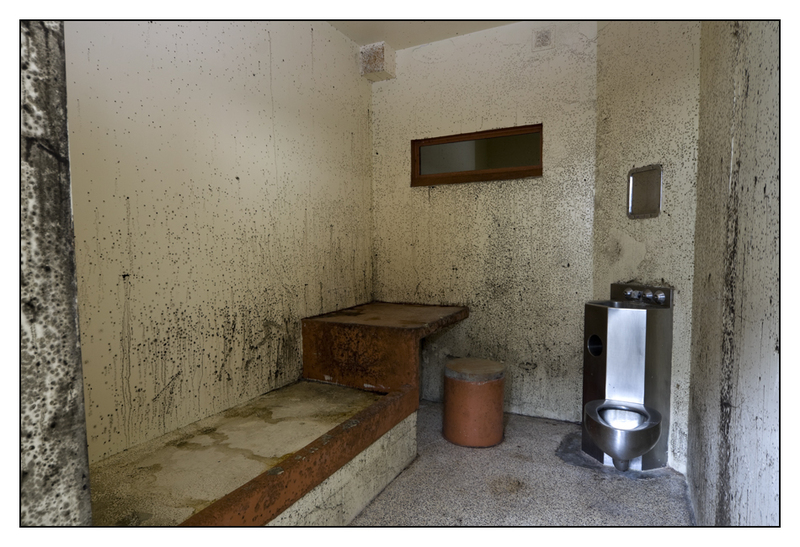 Many forensic clients spend time in these confines. I am familiar with one who spent a year in isolation but was allowed his mattress and a checker board. Obviously he was spoiled. I share this image not for your sympathy but in the hope it will elicit outrage. The Hole is Corrections Canada’s response to severe mental illness. Bill C-54 will find more individuals suffering from severe mental illness abandoned to these confines. Please have the courage to stand by my side. It is our only hope in leaving the Hole empty as it should be. This is Canada; this is shameful. We yelp about stigma while our feet are soaked with the shame of abuse. I can forgive and forget someone who calls me “crazy” but those who torture the mentally ill will never pass from my mind. This letter was written from a place that haunts me still. I think it is illustrative of the importance of “presence” at Christmas. Love is the punishment; it is what ties you to the outside world and pulls you in directions you are forbidden from going. I hope this letter finds you sometime during the holidays. Consider this your Merry Christmas and a Happy New Year as well. We haven’t had hot water for three days now. I was lucky and had my shower during the few moments when there was some. The kitchen is really messed up because they can’t do dishes. We have been served on Styrofoam plates with disposable spoons. Our cups are the same as we were issued on day one. I wonder how sanitary a cup is after several months without being washed in soap and water. Mine is brown inside, stained from hundreds of coffees and teas. At least it’s easy to keep separate from the new arrivals clean green cups. We also haven’t had yard for four days at least. The new mesh fell to the yard floor along with support cables with its first exposure to snowfall. One of the guys is getting out in the morning. I feel a little sad to see him go. We’ve shared this same small space for three and a half months. There were things I didn’t like about him, times I wished he wasn’t here, but when it’s all said and done we got along. That’s the most you can ask of your fellow inmates, to get along. I received a Christmas Card today. It is a northern scene of White Birch with a blanket of snow on the forest floor. Standing out from all the white is a bright green Spruce tree. I showed it to my cellmate and we decided we would use that little Spruce as our Christmas tree. So tonight December 18th we put up our tree. It was the first tree I put up that I didn’t curse at. It was nice to receive and let some spirit into our cell and some laughter into our hearts. I wish the same for all of you. I will miss you this Christmas but I will probably think of you all more than if I was there. I know I will never forget the Christmas I spent in jail but I wonder what will make it memorable; the spirit that will creep into our day or the spirit that is absent. No doubt some of each. Say ‘Hi to the dogs and use my name. I still have the card…thanks Candace, wherever life finds you.